Pokemon Ruby GBA Game Boy Advance Game Cartridge Cleaned Tested and Guaranteed to Work! SAVE BATTERY IS DEAD. Unacceptable due to price paid and assured it would be in working condition. Game came really quickly, and works flawlessly I've only ordered a few items on this site and will continue to use this site for all my gaming needs. The cartridge is pratically new; everything is in perfect condition. Gen III was beautiful and playing this game feels just right. My wife got this present for me for Christmas. I have not played any pokemon games since I played Gold back on the Game Boy when it first came out. I had a lot of fun playing it again and enjoyed being able to play it when I got a break from my busy school schedule. This was one of my favorite of the first three generations of pokemon! Now I am trying to find a sapphire cartridge for her to play. The only downside is that the internal battery has run dry, so some events cannot be used. I am not brave enough to try and change the battery myself, but that is ok because the game works great! Thanks Lukie! Great Buy from a Great Place! 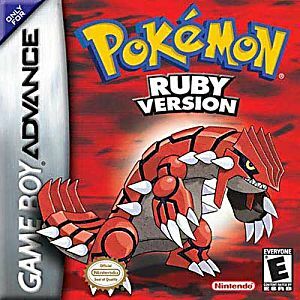 This remains my favorite Pokémon game to date! Loved this game and looked multiple places before finding it at Lukie Games! The price is cheap but the quality is excellent! The game works perfectly, and the cartridge itself looked wonderful. The label was perfectly in place and the cartridge did not have any scratches or damage to it. One happy (returning) customer! I was expecting the cartridge to look used, like most used cartridges do, but this one looks brand new. The paper label isn't even faded or anything. The internal battery has run dry, but that is to be expected on these games due to their age. For anyone reading this, and wondering what that means in regards to playing the game, it means that berries don't grow in real time, but that's not a problem. Simply leave that route and come back a few saves later and presto magic-o the berries will be grown. A+ to Lukie I WILL be ordering from you guys again. Although I ordered this by mistake, this game is clean and worked extremely well like new. The only minor problems are that it delivered slower than I expected and the internal battery was dry. Other than that, it's legit and much better than ebay and Amazon. Thank you Lukie Games. Arrived Fast, and got here in working condition but internal battery has ran dry and now I have to replace it but only downfall. Overall,pleased with my order as game is still playable. It arrived in great quality. It is a amazing game with great music that people of all ages will enjoy! I've looked everywhere for this game, but everything was too expensive. Lukie has the best price by far that I found. Excellent condition! works perfectly. Only issue is internal battery has run out. Cartridge was in really good condition. Worked the first time. At first I was sketchy about this site because the items and shipping costs were so cheap, that it seemed too good to be true. But boy was I wrong.This wewebsite is amazing. The pokemon ruby game I received was in great condition and arrived within 3 weeks. I can't wait to place my next order!